Wow, this is great news. Audacity has long been the goto audio app for Windows-based podcasters and others who wanted a capable audio editing environment. That said, it has had some stability problems over the years and has been slow to update. The crash recovery mode alone is worth the upgrade. You could recover from crashes before but it was a fiddly and time consuming process. I hope this makes it easier. Audacity also carries one big banner feature…it runs on nearly any computer platform including Windows, Mac and Linux. No wonder it has been the audio recorder of choice for so many for so long. 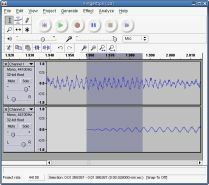 Windows/Mac/Linux: The free, open source sound editing program Audacity has been updated with a few new features. The most notable include improved effects, a ton of new keyboard shortcuts, and a handy automatic crash recovery mode.